The Navman GPS 4100 is the ultimate GPS receiver for anyone with a Bluetooth-enabled PDA device from manufacturers such as Palm, HP, Toshiba, Dell and Sony. The GPS 4100 delivers a combination of excellent build quality with the latest Bluetooth technology so you no longer need to put up with the sub-standard performance from your current GPS receiver when you can now benefit from the reliability, style and leading performance of the Navman GPS 4100. This compact, high quality receiver effortlessly communicates with your existing PDA and its GPS software to deliver a seamless connection that will enhance your navigational experience. 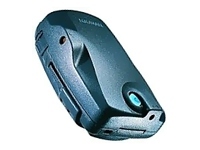 The GPS 4100 can deliver up to 30 hours wireless performance from 3 AAA batteries.